The Arts Academy currently operates within two campuses: The Learning Corridor and Colt Gateway. The Learning Corridor campus, at 15 Vernon Street in Hartford, is a $110 million campus on 16 acres. It houses three magnet schools extending from the eastern edge of Trinity College' campus on Broad Street to the Institute of Living on Washington Street. This Pre K-12 campus provides exquisite educational opportunities for neighborhood and suburban children alike, and has helped to beautify the neighborhood. Starting in 2019-2020 school year, The Learning Corridor will be the location for the Arts only half day program. The Learning Corridor is also home to our beautiful Theater of the Performing Arts. 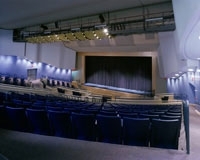 The theater is home to a state-of-the-art 635 seat Main Stage theater, black box theater, and gallery space. The space is used for all Academy performances and gallery showings and is available to the community for use for events. Click below to learn more about our space including fees for private use. In February 2011, the Colt Gateway campus, located at 160-172 Huyshope Street in Hartford, was opened. The facility holds spaces for academic classrooms, dance studies, multimedia production spaces, filmmaking space, and music studios. Starting in 2019-2020, this space will be the location of the Greater Hartford Academy of the Arts Full Day Program.